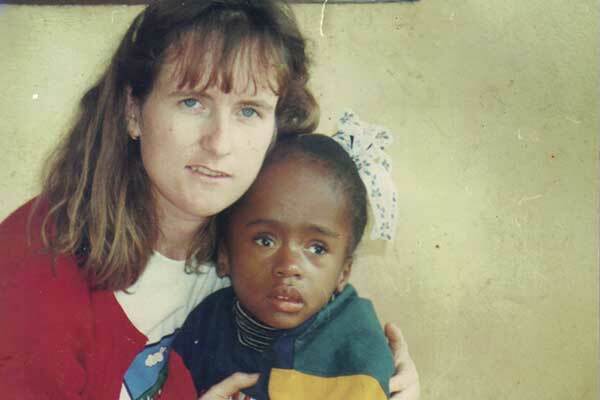 As a girl growing up in Mayo, Ireland, Gena Heraty beseeched God to show her where and how she was needed in the world, says Sarah Caden, and, ultimately, he sent her to Haiti. There, she found her calling among children with disabilities, shunned, discarded and neglected by their families and society. Gena has spent decades bringing love and first-world treatments to ‘her’ kids, but her huge heart always hopes for more. Here, she opens up her personal photo album to LIFE – Sunday Independent June 14th 2015. In the normal course of events, as the mother of a child with a disability, if you said “handicapped” to me, it would be a deal-breaker, a relationship terminator. 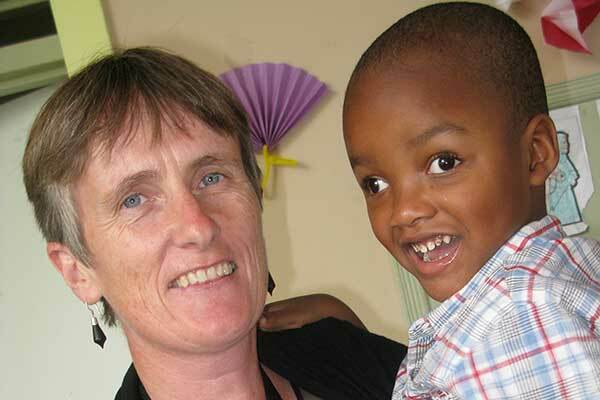 However, when Mayo woman Gena Heraty uses that word to describe some of the children she cares for in Haiti, it’s OK.
Gena gets a special dispensation, because what Gena is doing for the children with disabilities that she cares for is incredibly special. 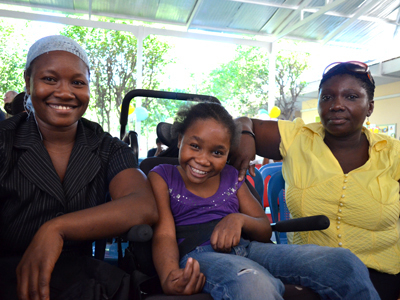 In Haiti, where people with intellectual and physical disabilities are routinely neglected and regularly shunned, Gena is a shining light. And Gena uses the word “handicapped” knowing that here in Ireland, the language of disability has moved on from such terms, but the language is not what matters in Haiti. Over there, she’s too busy trying to keep a roof over the heads of ‘her’ Haitian children and adults with special needs to pause and absorb the semantics. And what anyone associated with disability will tell you is that while language matters, actions matter even more, and Gena is a woman of action. Gena meets me in a Dublin city cafe en route from Mayo back to Haiti, where she has been for 22 years. She’s had a lovely time with her family, making scones with her mother despite her recent diagnosis as coeliac, catching up with her siblings and nieces and nephews and forcing herself to do some media spots to rustle up some much-needed funds for her work. Gena and “her” children with Fr. William Wasson, founder of NPFS Haiti. So, when we meet, as she travels back to Haiti, Gena’s head is already there. Her mind is on one of her children who is very sick, about whom doctors have said there is no hope “a million times”, but who keeps fighting. The worst thing, Gena says, is if one of the Haitian children dies when she’s in Ireland. Gena has been in Haiti since the early 1990’s. She went there after spending some time working for the Simon Community in Dublin, having always felt drawn to doing something meaningful in the world. An acquaintance in Simon told her about the Nos Petits Freres et Soeurs program in Haiti, a country she couldn’t even have found on the map at the time. But something about it chimed with her and she made contact and she went. 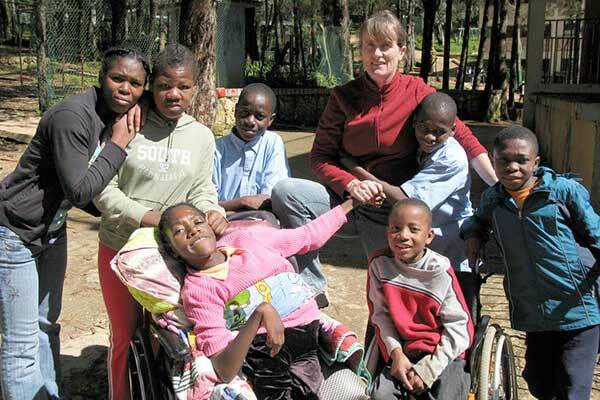 She found a country that didn’t know what to do with children with disabilities, and she found an organisation, a community, where she instantly felt she could help. And she did, and she does. 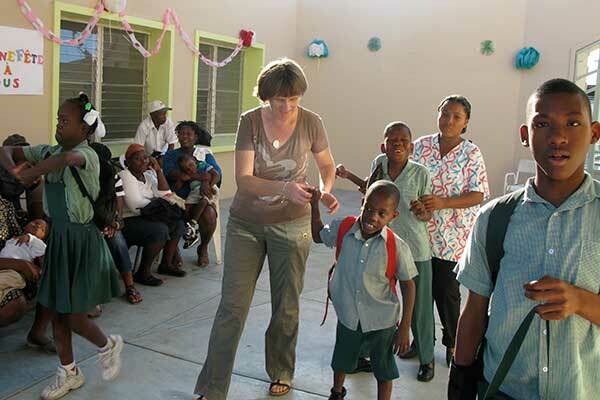 When Gena went to Haiti, the programs ambition was to build a home for children with special needs who had been abandoned. Now, with Gena as director, the program runs four facilities that give levels of care and therapy that would be the envy of many services in the developed world. They work to keep kids with disabilities with their families, in a country where, she explains, they are routinely abandoned and “humiliated” as useless and disposable. It’s hard work, but it’s harder work changing the culture of contempt in Haiti and near impossible work to raise the money to keep their services alive. Special needs child with her mother and a family friend. 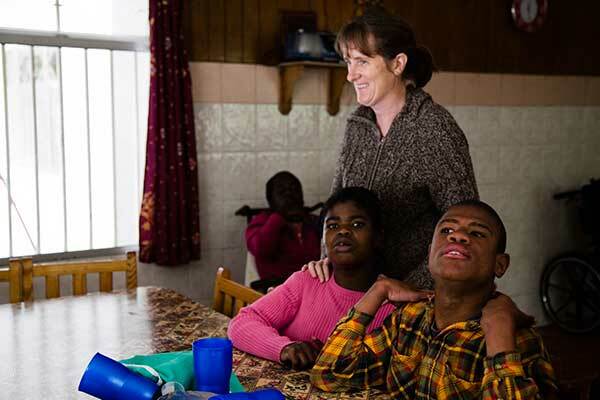 While Gena talks with compassion and sympathy about families, and specifically mothers, who want to do their best but just can’t, she goes hard on a Haitian society that dismisses out of hand their children with disabilities. She talks about how there are grants for people made disabled by the earthquake in 2010, but none for her children and adults. She talks about no availability of wheelchairs and no proper foot paths to wheel them on, anyway. She talks about a society that chooses to ignore that disability even occurs. Initially, in Haiti, Gena’s work was out in the country, up in the mountains. They had nine kids, who had been abandoned, who were being sent to Mexico, to a sister program for therapies and treatments. Gradually, they informally trained themselves up – with the help of visiting volunteer therapists – to help the children themselves and, slowly, the program developed. In 2004, around the time that Gena became director of the program, they began branching out to involve mothers and keep the children in their families. 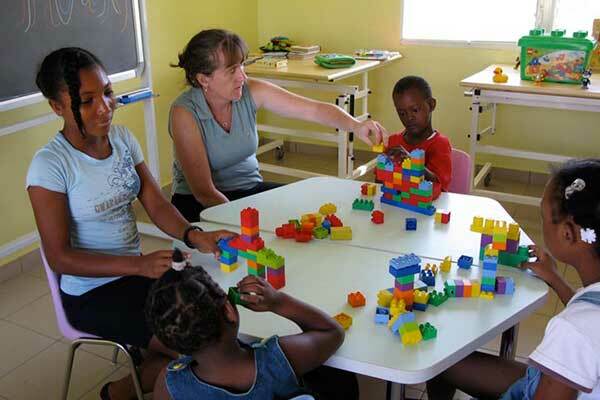 Nos Petits Freres et Soeurs offers education, therapy, support, and, increasingly, children stay with their mothers. Gena at Kay Christine, home to 30+ special needs children and adults. “In those years, we created a very good program,” she says, “and I always thought it could be replicated. People were always ringing me up about children in need and children who had been abandoned, but we didn’t have space for them. So I decided that what we really had to do was solve the problem of abandonment. 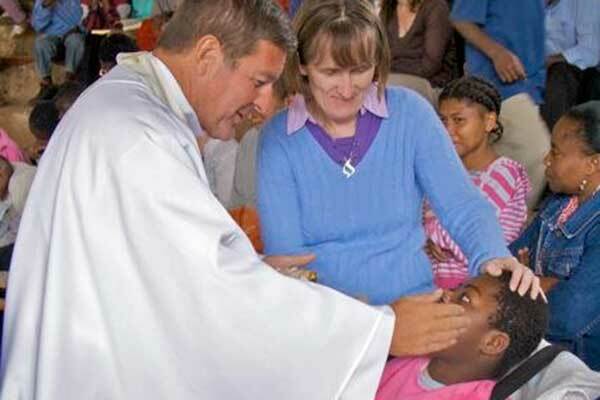 My dream is that every child and family in Haiti with special needs will have services and won’t be abandoned and shunned and rejected,” Gena says. With no sign of direction in sight, Gena followed her sister to the University of Limerick, where she got a degree in business studies. By the end of the course, she was despairing of what to do next, when she heard about a place in Dublin running courses preparing people for voluntary placements in the Third World. Gena approached the organisation and they advised her to undertake some voluntary work in Ireland first, and that led her to the Simon Community. 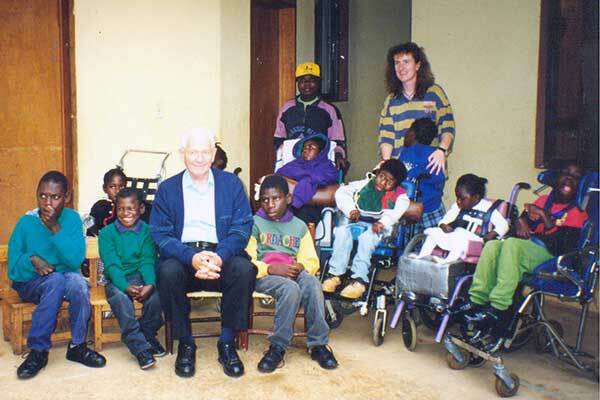 During her time there, Gena met a fellow volunteer who had been in Haiti, where he had been working with abandoned children with severe disabilities, for whom they were trying to build a home. He asked Gena if she’d come and help. “I said, ‘Yes, but I have no qualifications. I’ve no experience with handicapped kids,”‘ she explains. “He said, ‘If you are able to work in Simon, you are able to work there’:’ And so, off Gena went to Haiti. All she knew about the country was Papa Doc and the ‘awful heat’: When Gena arrived in Haiti, she was brought to this tiny house in the mountains where the abandoned children with disabilities were housed. There were only three children there when she arrived, as the others were in Mexico for treatments. The fellow volunteers showed her where they slept on mattresses on the floor beside the children and explained that the little house had once been a stable. “It all seemed so bleak,” Gena recalls. One month later, the six other children returned to Haiti. “We went to pick them up at the airport,” Gena says, “and they all had these really thick prism glasses on. They looked so weird, like aliens, and I thought, ‘Oh my God: I knew nothing about this, nothing about autism, or cerebral palsy or anything. Simon had been rough and ready, but nothing like this. I thought, ‘OK, this could be interesting.”‘ On the transport back to the mountains, a little girl called Eliane sat on Gena’s knee. Gena made it her mission to make Eliane laugh, and she did, and, later, one of the women told Gena that she’d never seen the little girl engage with anyone before. 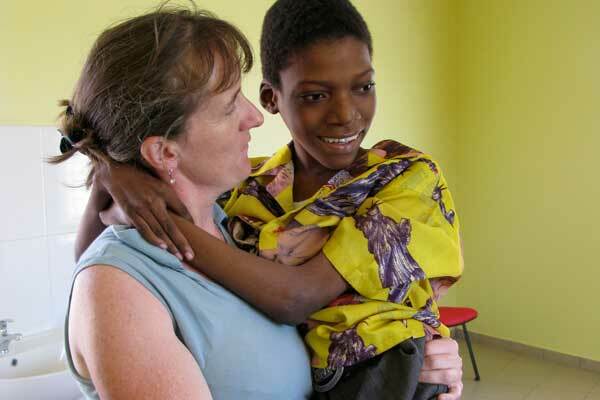 That connection with Eliane, who had hydrocephalus and had numerous operations and was very sick, became the turning point in Gena’s life. Children whom Gena and her team have loved and laboured for have died since and it has been hard every time. Even in the time between meeting Gena and writing this piece, she mails me about the loss of one of the young adults in their care. Also, as Gena admits, you can’t help but have pets, and she picks out a pair of twins that they cared for, both of whom had cerebral palsy. “This mother had three kids already,” Gena explains.” And then these two, with severe cerebral palsy. And we said, ‘No, we don’t take kids who have parents, so she went and came back a few months later and said, ‘I don’t want to abandon my children. I need to find them somewhere that I can visit them, but they are cared for,’ so we took them. These are the triumphs in Gena’s Haiti, triumphs that might seem small somewhere else, but which are big there. She talks about the school they run for children with disabilities giving them an education they would never get otherwise. She explains how she and her staff have no formal qualifications as therapists and teachers, but they have learned from professional volunteers who have visited. It’s a can-do attitude, instead of an attitude that could see them waiting forever for funding for staff with the degrees and the formal training. Her ambition, Gena says, is to create a situation where adults with disability could find a purpose and an occupation in Haitian society. Tiny, tiny steps is what it’s about, but she’s hopeful, and she is a person who can put a positive spin and find the hope in just about anything. For example, the 2013 attempted robbery at her accommodation in Port­ au-Prince, during which she was attacked with a hammer and a security man, Major, was killed. Ask Gena about this and she focuses attention on Major’s dedication and the fact that two of the young adults in her care rushed to her defense. Even then, Gena felt no diminishing of her sense of mission and no despair that she was fighting a losing battle in Haiti. She sees small ripples of change as a result of their efforts, she says, though it’s near impossible to get any financial support in Haiti. “My mission is to give a first-world service in a third-world country,” she says. But, for that, Gena needs support from the first world. Therapy center and school, Kay Germaine. “I get annoyed, you know? When I look at how it’s all grown, from a little house in the middle of nowhere to this facility, with hydrotherapy and classrooms and everything, I’m so amazed. But it’s all about money; that’s the pain in the neck.” She hates doing publicity, hates going on the radio or appearing in the press, but it’s necessary. “Denis O’Brien is a huge help,” Gena says. “He’s been fantastic. There was a young fella shot in front of our gate a while back, paralysed from the waist down, and I wrote an email about it and within a day, Denis O’Brien got back to me and asked was there anything he could do, and he paid off some of his bills in the hospital. And he’s creating employment in a country where there is none, and they’ve built 150 schools. Good schools with computer labs; I’ve been to them. People give off about him, but if only there were more people like him. “But, really, we get by on small donations,” she adds. “One million people giving a euro each is €1m.” She explains that they have no speech therapists at the moment, that they have let go three special needs assistants in the last year and scaled back various operations. They need to raise $500,000 (€460,000 ) in the next year to get things back to a level that Gena would be satisfied with, and that’s not even starting into working on building a vocational educational facility for young adults. Gena with children at NPFS St. Helene home in Kenscoff. Never, ever has Gena wished that she was somewhere else other than where she is in Haiti. Never once has she questioned her conviction that this is where she is meant to be. Without doubt, there are families in Haiti who believe her to be the answer to their prayers; but as far as Gena is concerned, Haiti is the answer to hers.